Whenever you are planning to use wall tiles for bathroom and kitchen, some checkpoints are necessary to keep in mind before starting to tile your wall straight away. Whether you are applying tiles to bathroom walls, a shower cubicle, kitchen backsplash, behind the cabinet or corner of a kitchen, we help you give stunning ideas to effectively use wall tiles in both kitchen and bathroom. Prior planning before tempting to start tiling is necessary to avoid any future obstruction. Select the appropriate tiles for kitchen and bathroom that best appeals the feature of walls. Kitchen and Bathroom is the heart of the home and ceramic tiles are considered to be best for Kitchen wall tiles and Bathroom wall tiles. Let's have a look at some of the ceramic wall tile designs for kitchen and bathroom. Create a magnificent wall with stunning, beautifully crafted and durable wall tiles. There are various types of tiles used for the residential and commercial purpose and if we think for residential need, ceramic tiles are perfect. Ceramic tiles possess the property of easy to clean, durable, prone to water and slip resistance, stain proof makes it best fit for wall tiles. Ceramic tiles are available in two forms glazed tiles and unglazed tiles in rustic, matt or glossy finish. Ceramic tiles obtained from clay and heat are unglazed while color applied after undergoing additional heating process is glazed tiles. Glazed Wall Tiles: Glazed wall tiles are also known as Digital wall tiles which are used for walls for kitchen and bathroom. They offer a wide variety of designs patterns and style to offer rich look to kitchen and bathroom walls. However, Glazed tiles size whose width to height ratio is 2:1. Read More: Look here for more bathroom wall tile design options. Mosaic Tiles: Mosaic tiles are attractive in appearance, it consists of tiny pieces of colorful stones, glass or colored material giving a decorative touch to tiles. It is available in various size and shapes like hexagon, round, square generally used in bathroom and kitchen backsplash to highlight the wall feature deeply. Quarry Tiles: This type of tiles are unglazed tiles usually made from natural clay making it more durable and scratch proof. Quarry tiles are available in several shades like red, grey, brown and many more used to apply on kitchen wall due to less maintenance and easy to clean characteristics. Quarry tile size range from 3”x3” to 12”x12”. Digital Printed Tiles: Printing technology has introduced new options in tile designs. Technology advancement has led to impose a digital printing or dying on tiles to have unique patterned tiles which can be used on the worktops of the kitchen giving a unique blended appearance of the wall. 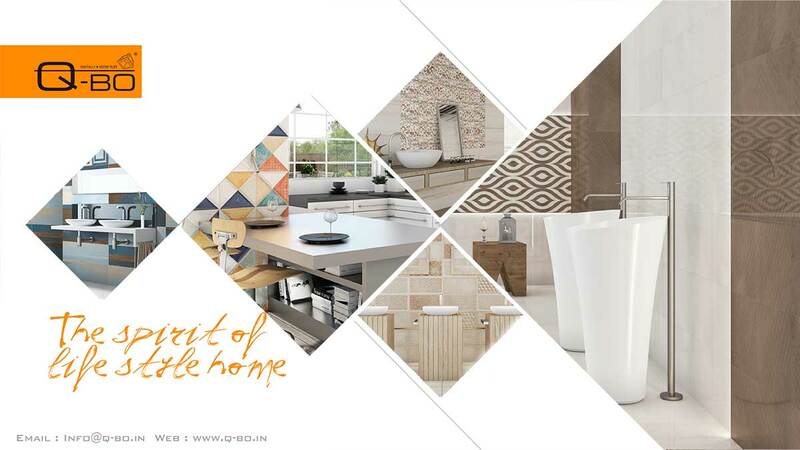 For more tile design options and information about the type of material, pattern, size and, color for wall tiles, get in touch with Q-BO Ceramics - a leading manufacturer and exporter of ceramic wall tiles and floor tiles. Our expert consultant will help you choose the right wall tile for your kitchen and bathroom.